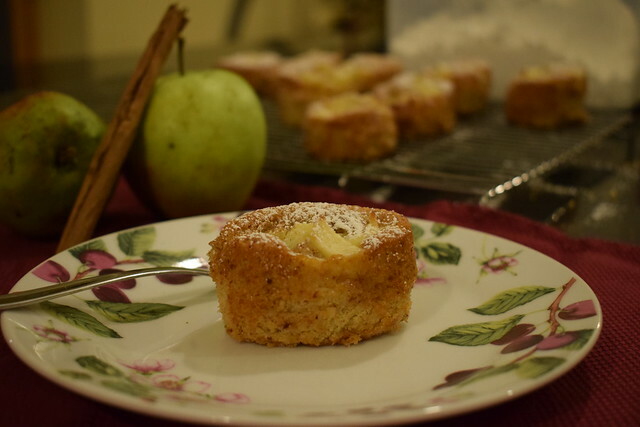 When it’s apple season it also happens to be pear season. My Grandmother always grew pears aswell as apples and always kept a fruit paring knife in her apron to dole out fruit to the hungry grandchildren. She always kept the pears on the windowsil to ripen. And for me, often, pears are like avocados. A 10 second window of ripeness that often happens, apparently, in the middle of the night, so that they go from rock- diamond hard to mush in 12 hours. 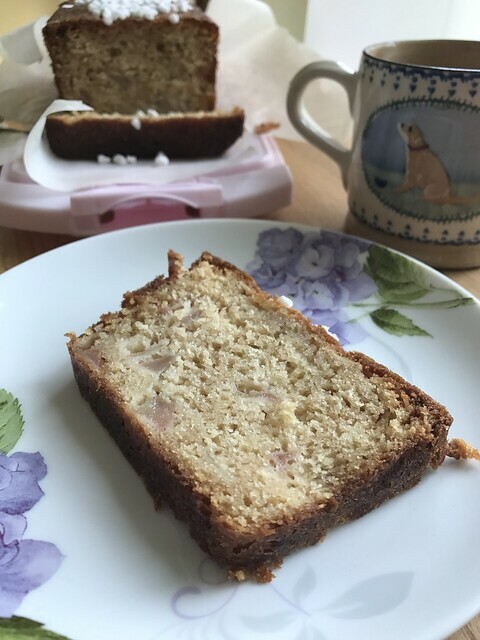 This cake uses pears, but they are nearly better when not quite ripe. Preheat the oven to 180°C and butter and line a loaf tin. In a large bowl, whisk the flour with the baking powder, baking soda and salt. In a medium bowl, whisk the sugar with the melted butter, buttermilk, eggs and vanilla. 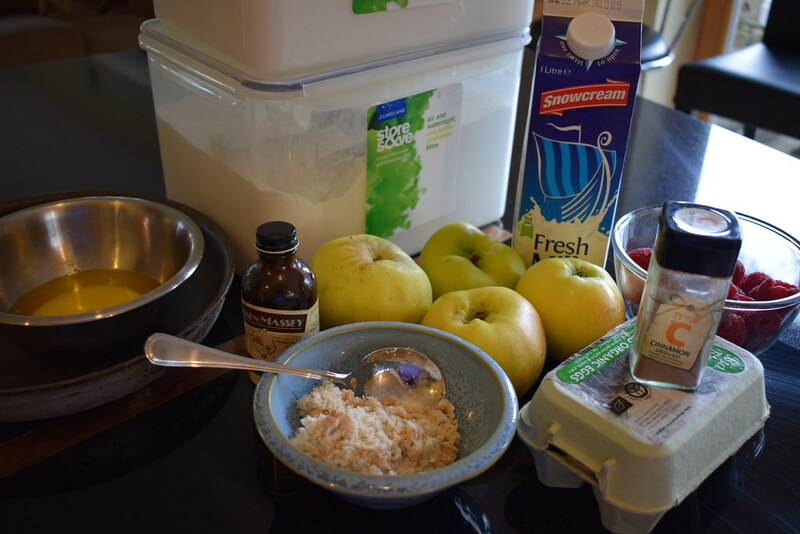 Using a wooden spoon, mix the wet ingredients into the dry ingredients, then fold in the pears and ginger. Scrape the mixture into the prepared pan. Bake in the centre of the oven for about 45 minutes until a skewer inserted into the centre comes out clean; loosely cover the top with foil during the last 15 minutes to prevent over-browning. 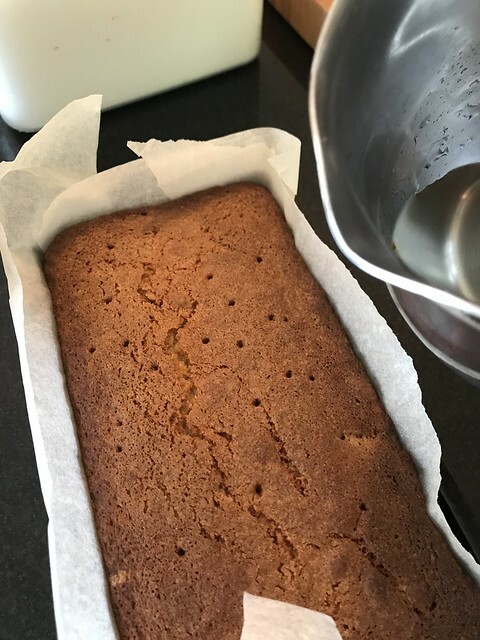 Transfer the cake to a wire rack and let cool completely in the pan. Invert the cake onto a plate and invert again. I like to “paint” the cake top with sugar syrup and I scatter some sugar crystals. Slice the cake and serve with some softly whipped cream. Butter a 10-inch oven proof frying pan and dust the bottom with the bread crumbs. 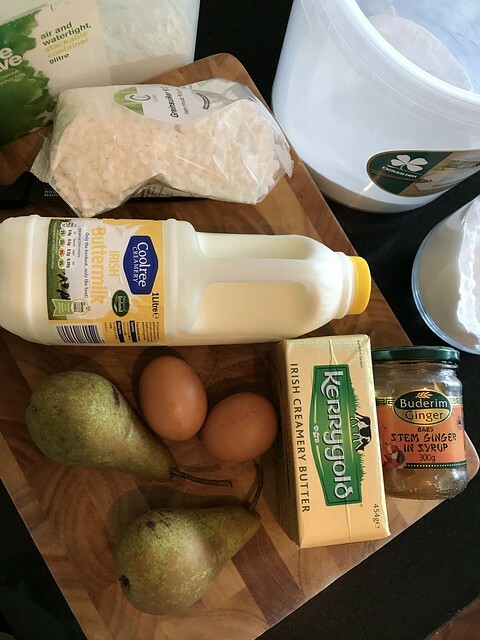 In a large bowl, using an electric mixer, beat the eggs with the milk, vanilla and 200g of the sugar. Beat in the melted butter until well mixed, then beat in the flour until a thick batter forms. In another large bowl, toss the cup of soft fruit with the sliced apples, cinnamon and the remaining sugar. 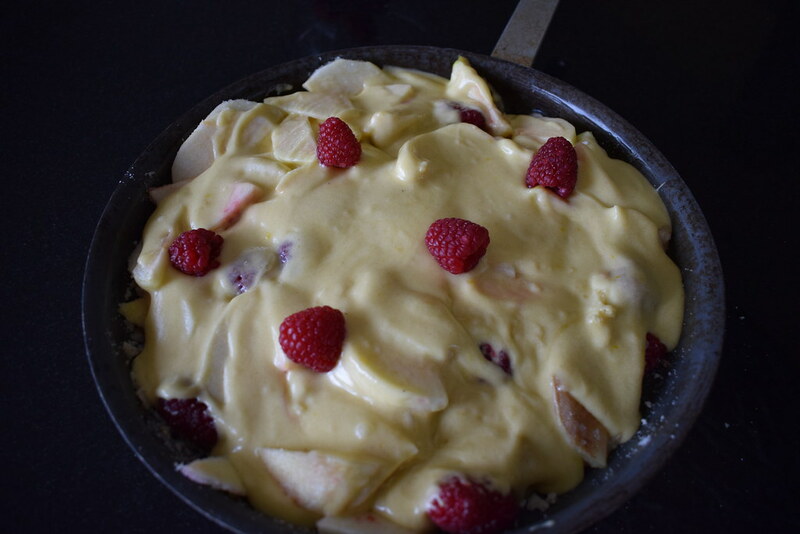 Spread one-fourth of the batter in the prepared skillet and top with the apples and berries. 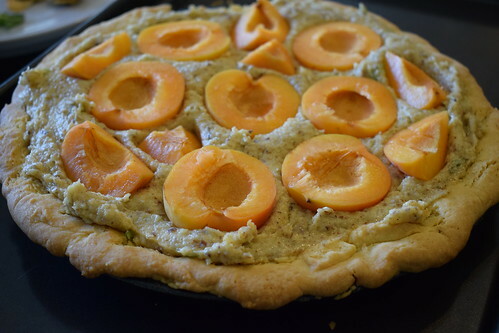 Using an offset spatula, spread the remaining batter over the fruit in an even layer. 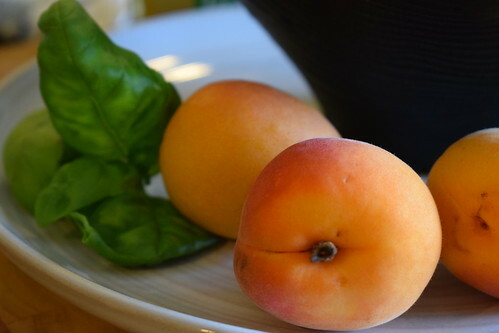 Scatter the remaining 8 to 12 pieces of fruit on top and gently press them into the batter. Bake in the centre of the oven for about 1 hour, until lightly golden and a toothpick inserted in the centre comes out with a few moist crumbs attached. Let cool completely, then dust with confectioners’ sugar. Slice into wedges and serve. 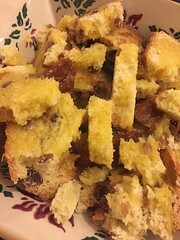 I just love bread and butter pudding. 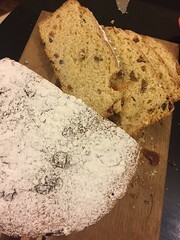 And we have some gorgeous panettone bread left over to use in the best way possible- this recipe is as good with brioche as with panettone. And really if push comes to shove, it’s good with any old white batch loaf type- just remove the crusts. 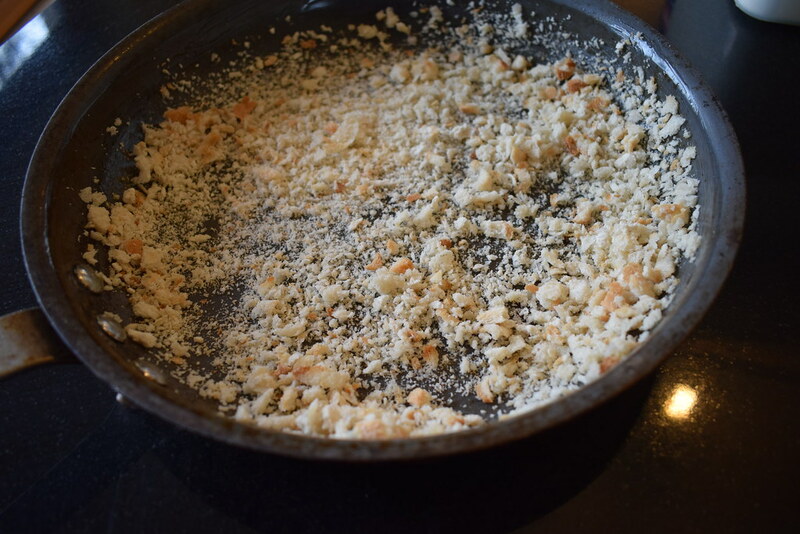 Sure you can’t make it ALL into breadcrumbs…. and using up leftovers is COOL these days. Preheat oven to 180oC. Place bread in large bowl. Drizzle with 3 tablespoons melted butter and toss. Transfer to rimmed baking sheet. Bake until bread begins to colour, stirring occasionally, about 12 minutes. Cool. 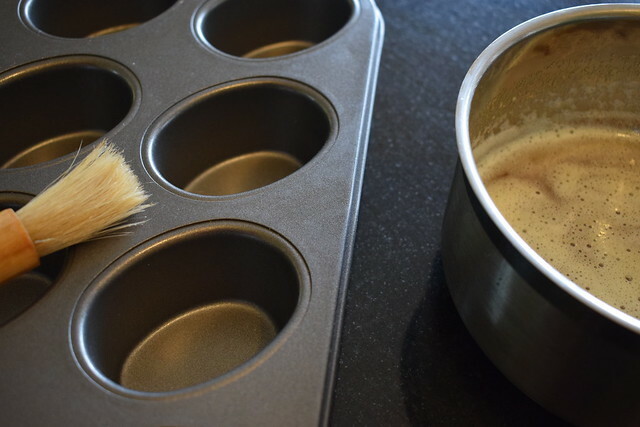 Brush your baking dish with 1 tablespoon melted butter. Heat the cream in a medium saucepan over medium heat until bubbling. Remove from heat. Whisk eggs and yolks in large bowl. Add rum, vanilla, and salt; gradually whisk in warm cream. Stir in bread cubes. Let soak 30 minutes, stirring occasionally. 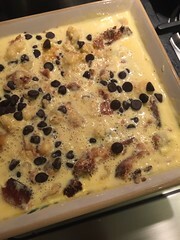 Mix chocolate chips into custard mixture. Pour into prepared dish. Sprinkle with 2 tablespoons sugar. Bake until puffed and set in centre, about 35 minutes. Let cool 15 minutes. Dust with powdered sugar. Serve warm, with some freshly whipped cream. Divine. Best to get the photo before it disappears! 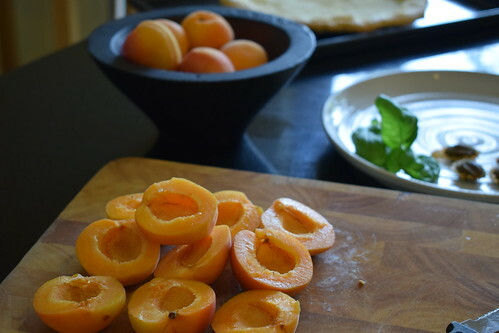 I just love apricots, they bring a taste of French summer into our home. And although I didn’t purchase mine from a market stall at the side of the road (Lidl’s best), they are still beautifully coloured and soft skinned. Preheat oven to 160oC. Put the paper cases in the tin. Mix the flour, baking powder, and salt in a bowl. 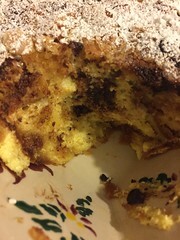 Using an electric mixer, beat the butter and sugar, occasionally scraping down sides of bowl, until light and fluffy, about 2 minutes. 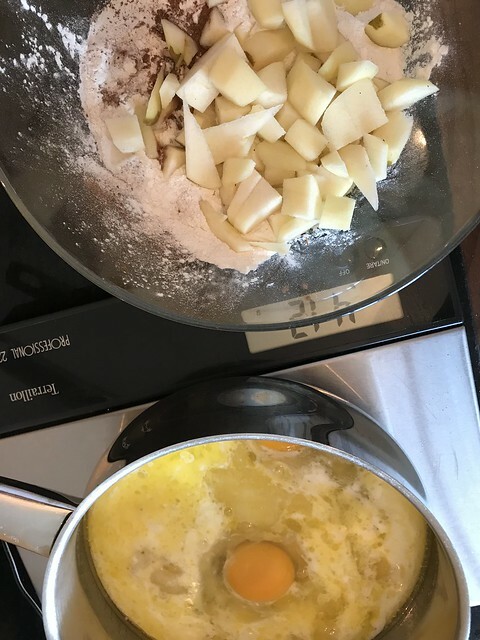 Add the egg and vanilla and beat until combined. With mixer on low speed, add the dry ingredients in 3 additions alternately with milk in 2 additions, beginning and ending with dry ingredients. 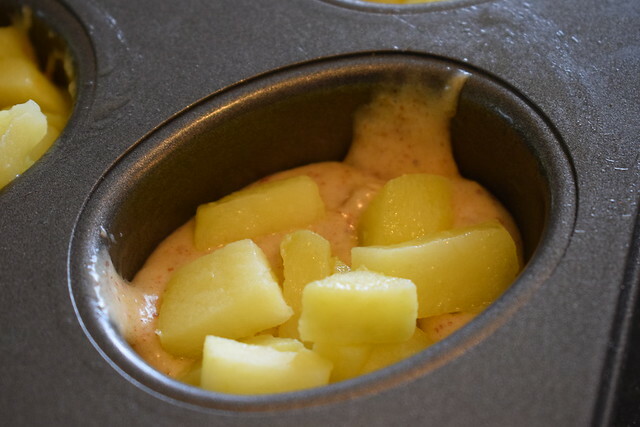 Divide this batter among muffin cups (cups will be only 1/3 full) and smooth tops. 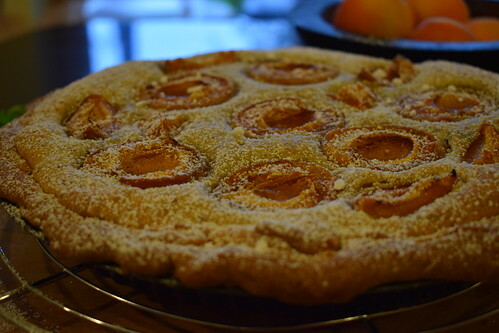 Top with the apricot slices and sprinkle liberally with brown sugar. 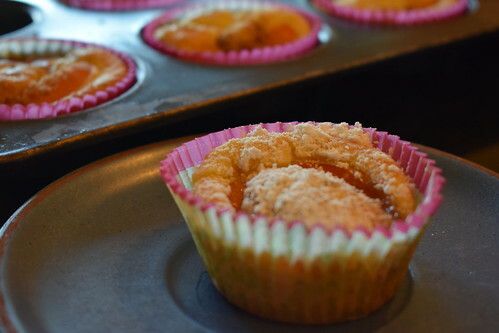 Bake until cakes are golden and a tester inserted into the centres comes out clean, 20–25 minutes. Transfer pan to a wire rack; let pan cool 5 minutes. Transfer cakes to rack and let cool completely. 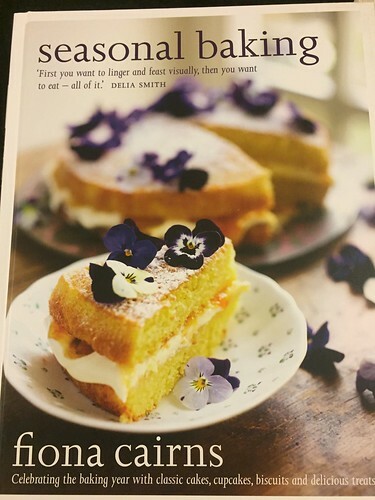 So when a suggestion of a cookbook called Seasonal Baking popped up in my suggestions, I jumped at it. I don’t have any other of this lady’s books. But had a little gander at her website, which unfortunately she doesn’t keep up to date. But she’s probably too busy making cakes! Being in the business of making cakes for over 25 years, I think she probably could be classed as an expert. I decided to be a little unseasonal (!) 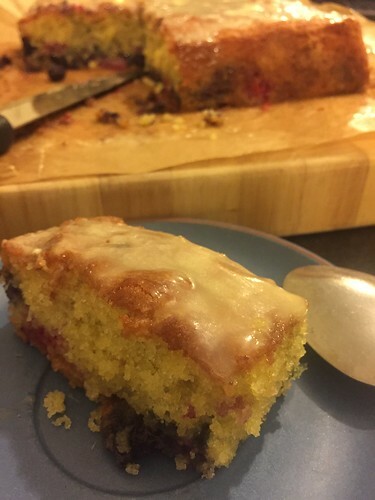 and make the white chocolate traybake, as I rarely use white chocolate, and I had some of our own berries in the fridge. 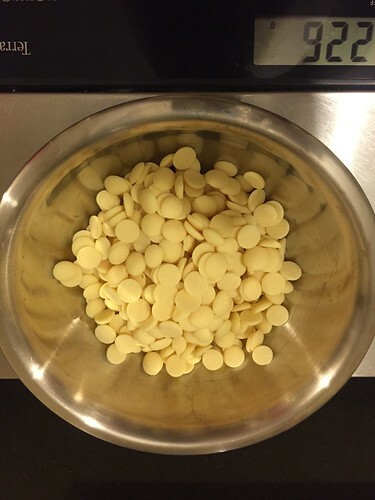 White Chocolate is a temperamental ingredient and it needs to be handled with care. It’s not chocolate in the strict sense as it doesn’t contain cocoa solids. It is difficult to melt, so for this recipe you really have to be organised and melt it very very slowly. but it’s worth it, I promise. 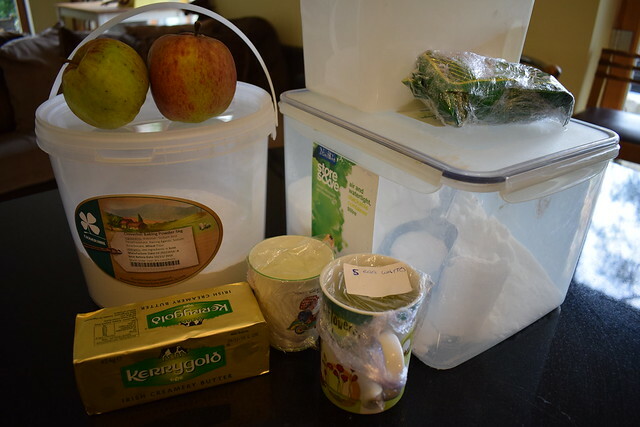 The fruit element is also very important, I have used fresh (bought) berries, but frozen work just aswell. Melt half of the white chocolate slowly over a saucepan of hot water. 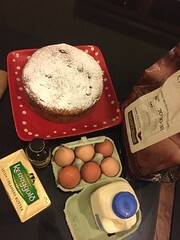 Meanwhile cream the sugar and softened butter well, add the flour, eggs, zest and baking powder and mix thoroughly. This is best done in the mixer, and beat the hell out of it. 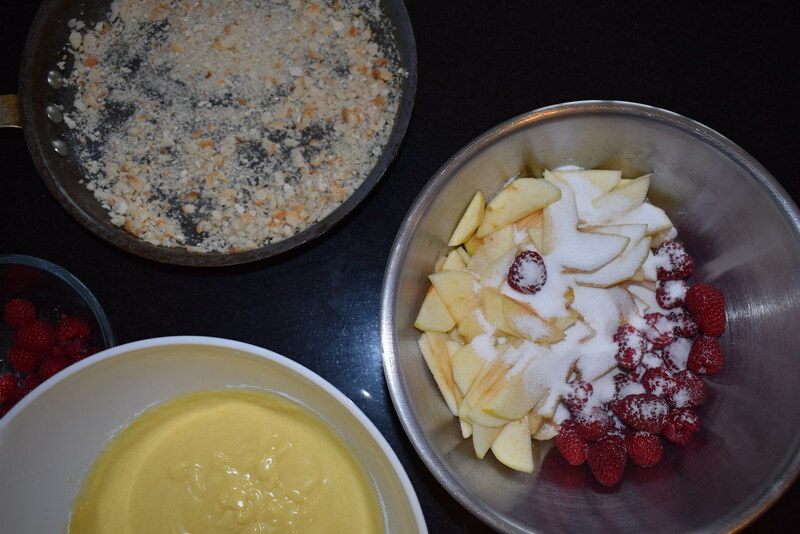 Mix in the other 100g of white chocolate and then gently stir in the berries. Bake at 170oC in a traybake tin for about 20 minutes. 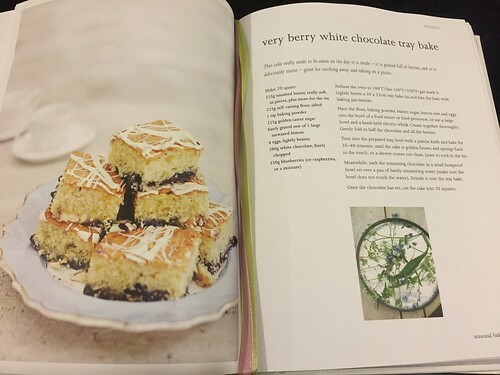 Leave to cool in the tin then maybe drizzle some extra melted white chocolate over it- to e sure to be sure! It’s tradition in our house that Santa puts a Terry’s Chocolate Orange in our stockings Christmas morning. And, to be honest, it’s the only time of year that I have one. Some have the family now prefer the darker version. I still like the milk version. 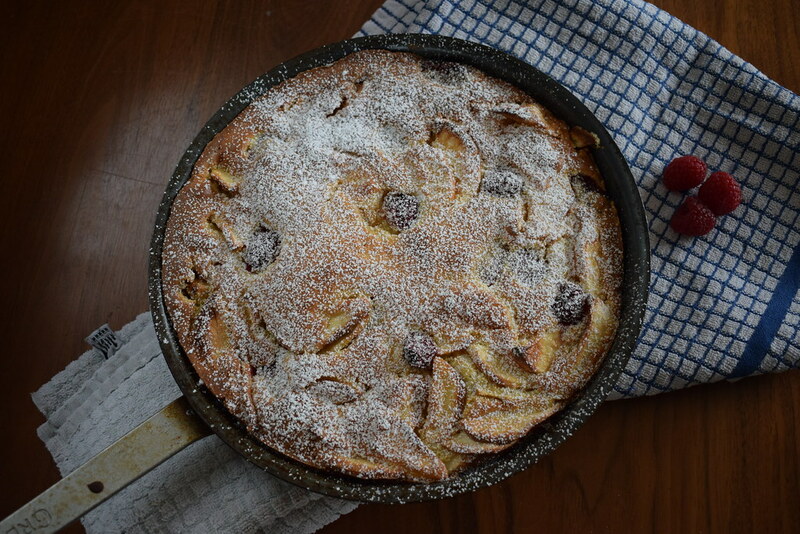 So when I was browsing through my cookery emails (BBC Good Food) I spied this little beauty, and had to try it. 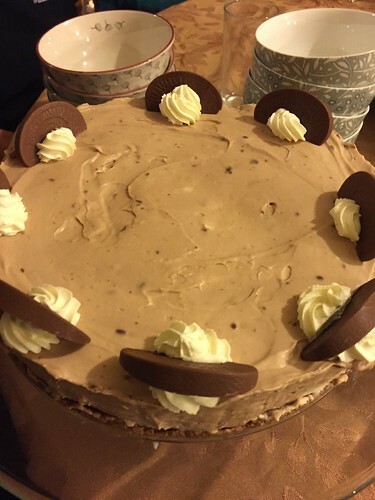 I’ve adjusted the recipe as the original doesn’t make a big enough dessert, I’ve also used Chocolate Orange Digestives in the base, for an extra kick of chocolate AND orange. Crush the biscuits and mix well with the melted butter to make the base. Press this into a loose ring cake tin (8”) and leave to set in the fridge. Meanwhile melt 1 1/5 of the chocolate oranges and set aside. As an aside, we do not have a microwave, so I always give a warning if melting chocolate in the microwave- it’s SO EASY to burn. Whip together the cream cheese and the icing sugar. In a separate bowl whip the cream until soft peaks form. Add this to the cream cheese mix, and fold gently but well until completely combined. 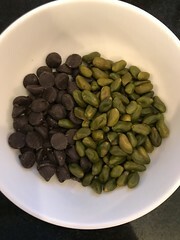 At this stage I move some of this mix into the “cream” bowl. Then add the melted chocolate into the main mixture. This gets mixed well, and then I swirl the “cream” bowl mix through to give a fancy pattern! Then carefully add the whole lot onto the cold biscuit base. 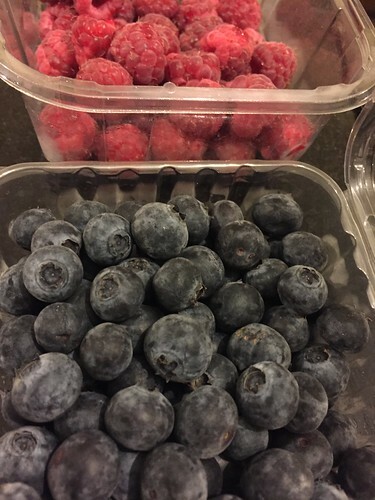 Refrigerate until set, approx. 5 hours. 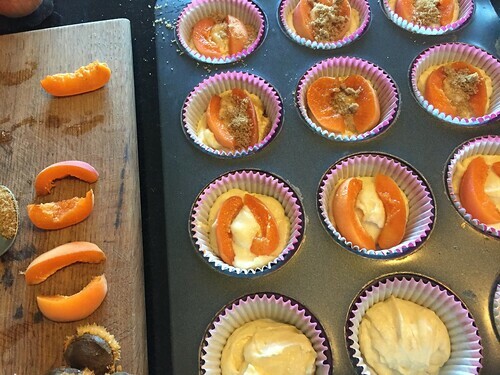 Remove carefully from the tin, pipe some freshly whipped cream onto it and decorate with the extra orange pieces.